My calendar says it’s International Rabbit Day, so what better time to remind you of the many ways you can help these remarkable animals? Despite being one of the most popular companion animals in the country, rabbits are among the most exploited. Domestic rabbits—cherished for their playful, gentle natures—are skinned for their fur, blinded to test cosmetics, bred for show, drugged for science, clipped for wool products, pulled out of magicians’ hats, killed in vivisection labs, sold as food for pet snakes, and raised and shipped by breeders. To add insult to all this injury, we chop off their paws and tout the rabbit’s foot as a “good luck” charm. So here are 10 things you can do—and not do—to make their lives a little better. 1. Adopt, Don’t Shop. If you decide a rabbit is right for you, adopt one from a local animal shelter or the House Rabbit Society rather than buying one. You’ll save a life and discourage rabbit breeding. 2. 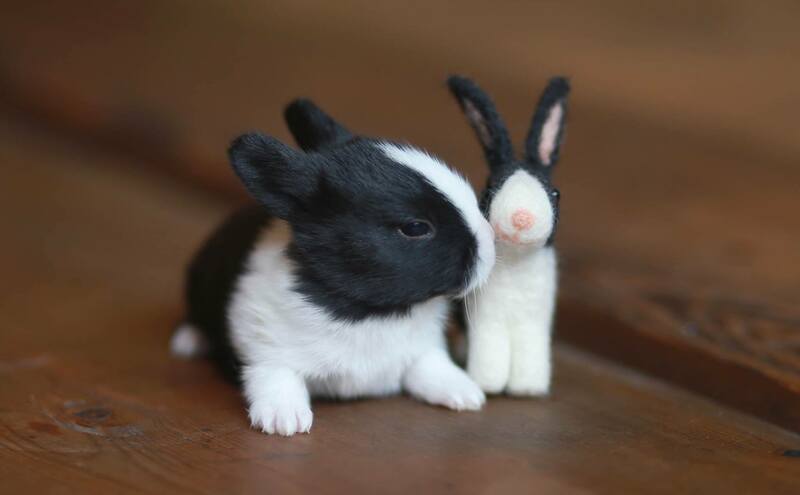 Make Companion Rabbits Part of Your Family. Don’t relegate a rabbit to a backyard hutch or cage. These are affectionate, playful animals who deserve to live with you indoors, where they are safe from predators and inclement weather. 3. Don’t Buy Clothing or Accessories Made from Rabbits. Or any other animal. That means no rabbit-fur hats, no angora sweaters, no fur-trimmed coats, no leather—you get the idea. 4. Treat Wild Rabbits with Kindness. Free-living bunnies mowing through your vegetable garden or digging holes in your backyard? Please use humane methods to deal with them, such as these compassionate suggestions from the Humane Society of the United States. 5. Ask Your Market Not to Sell Them. You may be aware that Whole Foods Market recently announced it was going to stop selling bunnies in their meat cases. While this is great news, other stores still offer bunny meat. If the market where you shop does, fill out a customer comment card or speak directly with the manager and ask that they stop selling rabbits. 6. Don’t Patronize Restaurants That Serve Bunny Meat. Better yet, ask them to stop. 8. Support the Humane Cosmetics Act. Ask your U.S. Representative to support H.R. 2858, the Humane Cosmetics Act, which will prohibit animal testing for all cosmetic products manufactured or sold in the United States. 9. Volunteer at Your Local Shelter. There is plenty to do: Socialize the rabbits, clean their cages, bring them hay and veggies, and do whatever they need to keep them healthy and happy and to make them more adoptable. (You may need to attend a training session with the shelter staff in order to be a shelter volunteer.) Check out these tips from the House Rabbit Society for more information about volunteering. 10. Support Rescue Nonprofits. There are so many wonderful rabbit groups out there, and they all need your support, either as a donor, volunteer, or bunny foster parent. Some of my favorites include the House Rabbit Society, Rabbit Haven, Rabbit Rescue, Rabbitron, SaveABunny (from whom I adopted all my rabbits), Special Bunny, and Zooh Corner. Check Google for a group near you, or ask the House Rabbit Society for the closest chapter in your area. Note: If you like the photos that accompany this post, you’ll love the Tallulah & Rabbit Friends Facebook page, maintained by Tara Baxter. 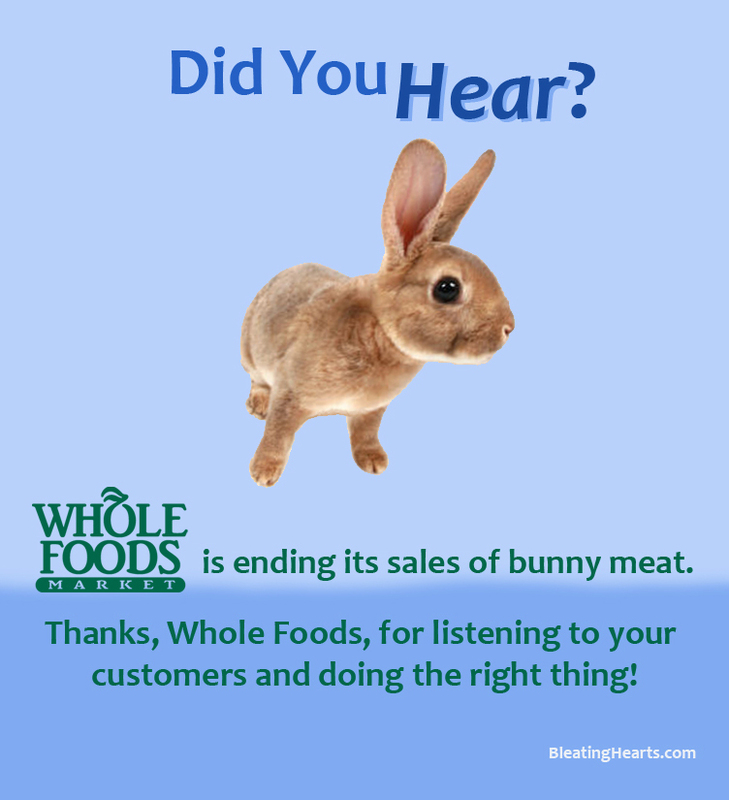 As an example of what an impact animal advocates can have, it’s hard to top this week’s news that Whole Foods Market (WFM) will cease selling rabbit meat in their stores effective January 2016. The grocery giant made the announcement at a shareholders meeting in Charlotte, North Carolina, on Tuesday. Protesters demonstrate at the Whole Foods Market in Sebastopol, Calif., soon after activist lauren Ornelas was arrested for leafleting to customers. This victory came quickly when compared to other animal rights campaigns that can go on for years. It began in 2014, shortly after WFM launched a pilot program aimed at creating a market for rabbit meat. My wife lauren Ornelas (founder of Food Empowerment Project) and I sat down with Rabbit Advocacy Network founder Tara Baxter, SaveABunny founder Marcy Schaaf, Anne Martin of the House Rabbit Society, and (by phone) House Rabbit Society president Margo DeMello to brainstorm strategies for getting WFM to end its program. As a longtime activist, lauren has tangled with Whole Foods before over the treatment of ducks to be sold in their stores. She was also arrested while campaigning against a location’s bunny meat sales: in November 2014, the manager of our local WFM had her arrested for leafleting in front of the store, though the paperwork to prosecute her was never filed. 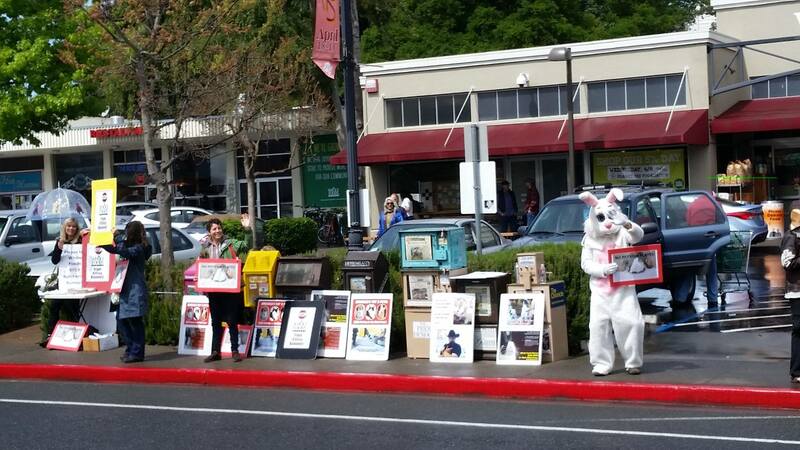 We had a contingent of advocates strategizing in the Bay Area, but as word spread among animal lovers, petitions were launched, activists were demonstrating outside Whole Foods stores, memes went viral, and customers were boycotting the chain from coast to coast. Tara was interviewed for an episode of Our Hen House, and she and Marcy appeared in an NBC Bay Area investigative news report (a follow-up report aired September 17). Through the Freedom of Information Act, lauren obtained inspection records for the farm in Iowa that’s been supplying WFM with bunny meat. The records revealed several observations that may not be in keeping with Whole Foods’ stated animal welfare standards, and activists used the information to illustrate the cruelty inherent in factory farming rabbits (for example, here and here). In addition, while WFM said they were selling rabbits in response to “consumer demand,” a financial analysis showed that sales were slow at its stores around the country. 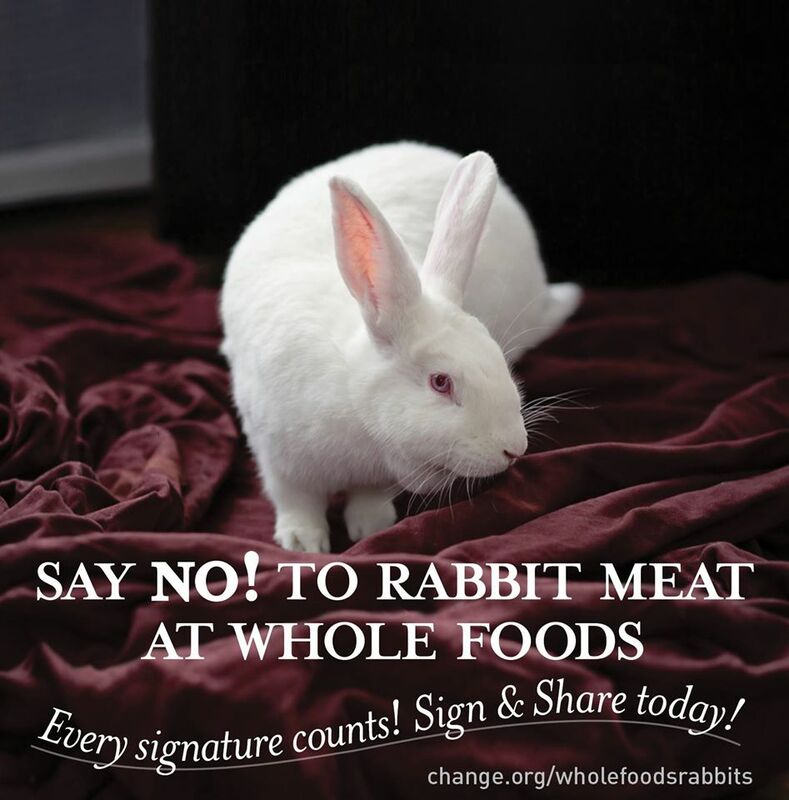 In the Northern California region, for example, WFM’s 41 stores are selling only one to three rabbits each per day. Indeed, low sales is the explanation WFM has given for their decision to stop selling bunny meat. Another reason for this success, I think, is that activists were quick to agitate as soon as WFM began selling rabbits. We also tried to make it clear that we weren’t saying rabbits were more deserving of moral consideration than cows, pigs, chickens, fish, or any other animal raised and killed for food. What we were saying is that WFM does not need another species to exploit and kill for its meat cases. Moreover, WFM is seen as a trendsetter in the food industry, and we understood that if they were successful, other grocery companies would implement similar sales of bunny meat. If you shop at Whole Foods, please let them know you appreciate their decision to stop exploiting at least one species. 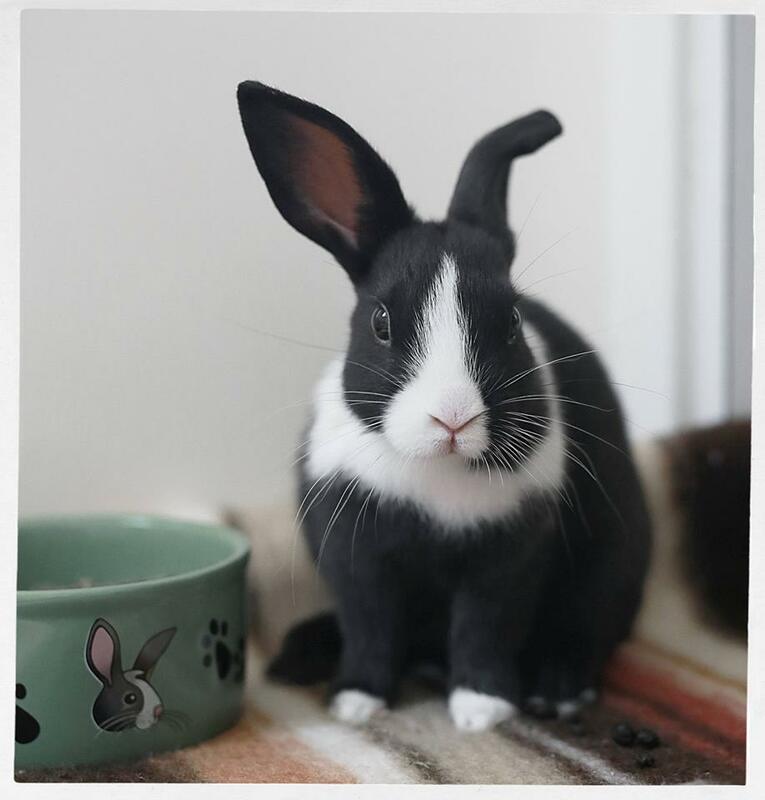 And, of course, if you’d like to do even more, please consider adopting a rabbit!